What is the best day to visit the Tokyo Zoo? 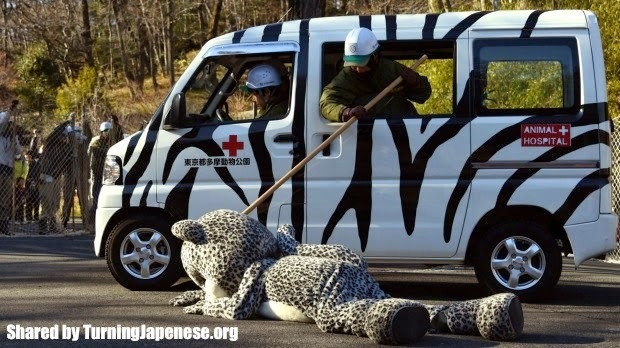 On a cold February day every year, an animal escapes from a Tokyo zoo. This year it was a snow leopard, who ran around the place, attacked one of the zoo staff, but was eventually (and fortunately) tranquillised before anyone was really hurt. "He's not scary at all, but chasing him down the hill must have been quite a bit of work"
Because 'escape' is not quite the right word for the incident, as they in fact let the animal out on purpose, nor is the word 'tranquilised' as there was nothing in the dart, and it was not actually a snow leopard. "We think it is very important, and it is our responsibility to carry it out with seriousness. In the event of a big earthquake, a tree could fall on a cage, or many other things could occur that may lead to an animal escape". 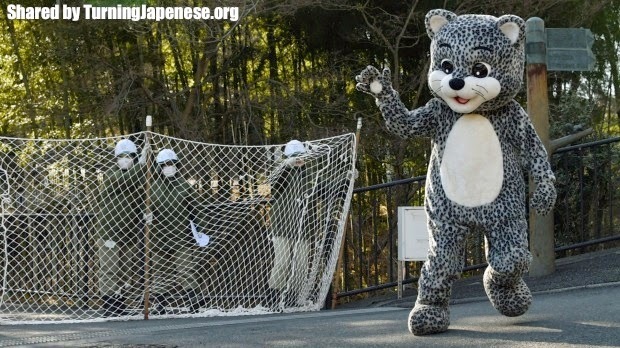 So the snow leopard was not actually a snow leopard, but simply an employee dressed up as one, who was lucky (or unlucky) enough to get paid for dressing up and running around his workplace as a wild animal (Last year, I was threatened with dismissal for doing exactly the same thing, although I don't work in a zoo). In previous years other escaped 'animals' have included a gorilla, lion, orangutan, rhinoceros and a zebra (see full picture below). While I'm not exactly sure what would happen if a real animal escaped on the day set down for the simulation, although I'm sure the other staff and media would be very impressed with the acting ability of this particular 'employee'. 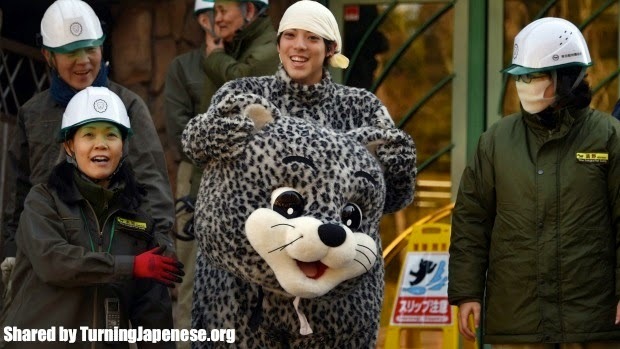 However you will please to know that this year's escape, by Toshiya 'snow leopard' Nomura, went particularly well. He was fast. He was popular. There were laughs, there were tears. 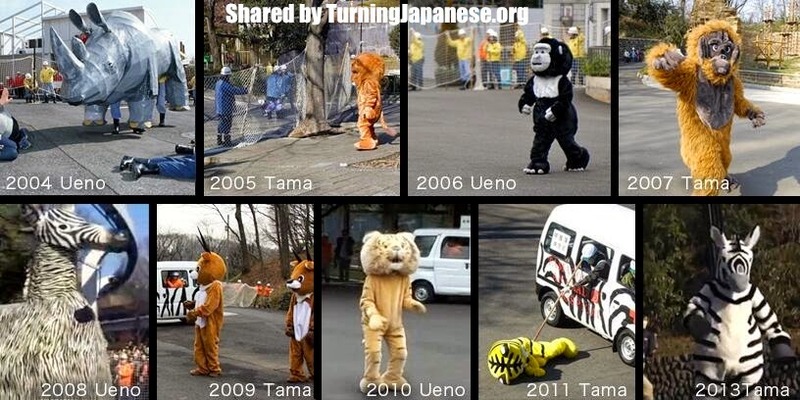 And importantly for the Japanese publicity, he was cute, despite his strict instructions to be 'scary' which included a hilarious pretend attack on a fellow zoo employee, who required CPR. While Tama Zoo, and Ueno zoo are probably not the best zoos in the world, nor would they make it on to the Top 10 list of things to do in Tokyo, they are cheap (600 yen for adults and free for under 12 year olds), they are convenient, and they are fun, even more so on the day the animals escape.